Qatar (/ˈkætɑːr/, /ˈkɑːtɑːr/ (listen), /ˈkɑːtər/ or /kəˈtɑːr/ (listen); Arabic: قطر‎ Qaṭar [ˈqɑtˤɑr]; local vernacular pronunciation: [ˈɡɪtˤɑr]), officially the State of Qatar (Arabic: دولة قطر‎ Dawlat Qaṭar), is a country located in Western Asia, occupying the small Qatar Peninsula on the northeastern coast of the Arabian Peninsula. Whether the sovereign state should be regarded as a constitutional monarchy or an absolute monarchy is disputed. Its sole land border is with neighbouring Gulf Cooperation Council (GCC) monarchy Saudi Arabia to the south, with the rest of its territory surrounded by the Persian Gulf. An arm of the Persian Gulf separates Qatar from the nearby Bahrain. In 628, Muhammad sent a Muslim envoy to a ruler in Eastern Arabia named Munzir ibn Sawa Al Tamimi and requested that he and his subjects accept Islam. Munzir obliged his request, and accordingly, most of the Arab tribes in the region converted to Islam. After the adoption of Islam, the Arabs led the Muslim conquest of Persia which resulted in the fall of the Sasanian Empire. As of 2014, certain provisions of the Qatari Criminal Code allows punishments such as flogging and stoning to be imposed as criminal sanctions. The UN Committee Against Torture found that these practices constituted a breach of the obligations imposed by the UN Convention Against Torture. Qatar retains the death penalty, mainly for threats against national security such as terrorism. Use of the death penalty is rare and no state executions have taken place in Qatar since 2003. In Qatar, homosexual acts are illegal and can be punished by death. As a small country with larger neighbours, Qatar seeks to project influence and protect its state and ruling dynasty. The history of Qatar's alliances provides insight into the basis of their policy. Between 1760 and 1971, Qatar sought formal protection from the high transitory powers of the Ottomans, British, the Al-Khalifas from Bahrain, the Arabians, and the Wahhabis from Saudi Arabia. Qatar's rising international profile and active role in international affairs has led some analysts to identify it as a middle power. Qatar was an early member of OPEC and a founding member of the Gulf Cooperation Council (GCC). It is a member of the Arab League. The country has not accepted compulsory International Court of Justice jurisdiction. In recent years, Qatar has been using Islamist militants in a number of countries including Egypt, Syria, Libya, Somalia and Mali to further its foreign policy. Courting Islamists from the Muslim Brotherhood to Salafist groups has served as a power amplifier for the country, as it believes since the beginning of the Arab Spring that these groups represented the wave of the future. David Cohen, the Under Secretary for terrorism and financial intelligence at the U.S. Treasury, said that Qatar is a "permissive jurisdiction for terrorist financing." There is evidence that these groups supported by Qatar include the hard-line Islamic militant groups active in northern Syria. As of 2015, Qatar, Saudi Arabia and Turkey are openly backing the Army of Conquest, an umbrella group of anti-government forces fighting in the Syrian Civil War that reportedly includes an al-Qaeda linked al-Nusra Front and another Salafi coalition known as Ahrar ash-Sham. For statistical purposes, the municipalities are further subdivided into 98 zones (as of 2015), which are in turn subdivided into blocks. As of 2016, Qatar has the fourth highest GDP per capita in the world, according to the International Monetary Fund. It relies heavily on foreign labor to grow its economy, to the extent that migrant workers compose 86% of the population and 94% of the workforce. Qatar has been criticized by the International Trade Union Confederation. The economic growth of Qatar has been almost exclusively based on its petroleum and natural gas industries, which began in 1940. Qatar is the leading exporter of liquefied natural gas. In 2012, it was estimated that Qatar would invest over $120 billion in the energy sector in the next ten years. The country was a member state of Organization of Petroleum Exporting Countries (OPEC), having joined in 1961, and having left in January 2019. Established in 2005, Qatar Investment Authority is the country's sovereign wealth fund, specializing in foreign investment. Due to billions of dollars in surpluses from the oil and gas industry, the Qatari government has directed investments into United States, Europe, and Asia Pacific. As of 2013, the holdings were valued at $100 billion in assets. Qatar Holding is the international investment arm of QIA. Since 2009, Qatar Holding has received $30–40bn a year from the state. As of 2014, it has investments around the world in Valentino, Siemens, Printemps, Harrods, The Shard, Barclays Bank, Heathrow Airport, Paris Saint-Germain F.C., Volkswagen Group, Royal Dutch Shell, Bank of America, Tiffany, Agricultural Bank of China, Sainsbury's, BlackBerry, and Santander Brasil. As of 2012, Qatar has proven oil reserves of 15 billion barrels and gas fields that account for more than 13% of the global resource. As a result, it is the richest state per-capita in the world. None of its 2 million residents live below the poverty line and less than 1% are unemployed. ^ "Bahrain". maritimeheritage.org. Retrieved 17 January 2015. 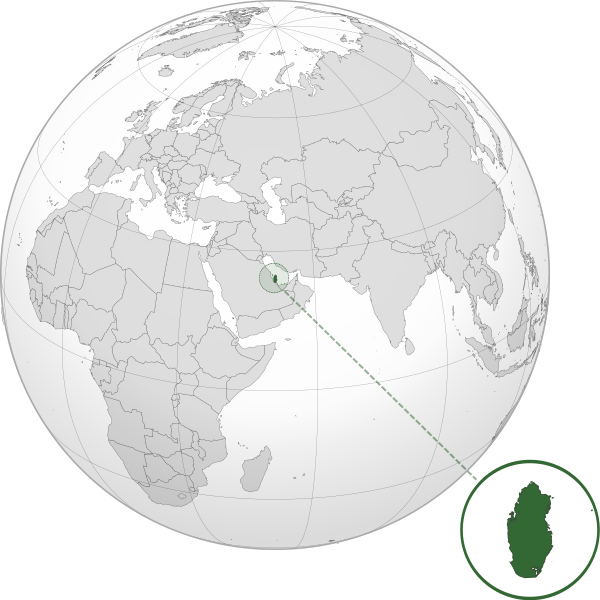 The 2017–19 Qatar diplomatic crisis began in June 2017, when Saudi Arabia, United Arab Emirates, Bahrain, Egypt, the Maldives, Mauritania, Senegal, Djibouti, the Comoros, Jordan, the Tobruk-based Libyan government, and the Hadi-led Yemeni government severed diplomatic relations with Qatar and banned Qatari airplanes and ships from entering their airspace and sea routes along with Saudi Arabia blocking the only land crossing.The Saudi-led coalition cited Qatar's alleged support for terrorism as the main reason for their actions, insisting that Qatar has violated a 2014 agreement with the members of the Gulf Cooperation Council (GCC). Saudi Arabia and other countries have criticized Al Jazeera and Qatar's relations with Iran. Qatar acknowledges that it has provided assistance to some Islamist groups (such as the Muslim Brotherhood), but denies aiding militant groups linked to al-Qaeda or the Islamic State of Iraq and the Levant (ISIL). Qatar also claims that it has assisted the United States in the War on Terror and the ongoing military intervention against ISIL.Initial supply disruptions were mitigated by additional imports from Iran and Turkey, and Qatar did not agree to any of the Saudi-led coalition's demands. The demands included reducing diplomatic relations with Iran, stopping military coordination with Turkey, and closing Al-Jazeera. On 27 July 2017, Qatari foreign minister Mohammed bin Abdulrahman Al Thani told reporters that Egypt, Saudi Arabia, United Arab Emirates and Bahrain were showing "stubbornness" to Qatar and had not taken any steps to solve the crisis. Al Thani added that the Security Council, the General Assembly and "all the United Nations mechanisms" could play a role in resolving the situation. On 24 August 2017, Qatar announced that they would restore full diplomatic relations with Iran. The 2022 FIFA World Cup is scheduled to be the 22nd edition of the FIFA World Cup, the quadrennial international men's football championship contested by the national teams of the member associations of FIFA. It is scheduled to take place in Qatar in 2022. This will be the first World Cup ever to be held in the Arab world and the first in a Muslim-majority country. This will be the first World Cup held entirely in Asia since the 2002 tournament in South Korea and Japan (the 2018 competition in Russia featured one Asian venue, Yekaterinburg). In addition the tournament will be the last to involve 32 teams, with an increase to 48 teams scheduled for the 2026 tournament. However, FIFA President Gianni Infantino indicated that this change may come earlier for the 2022 World Cup. The reigning World Cup champions are France.This will also mark the first World Cup not to be held in May, June, or July; the tournament is instead scheduled for late November until mid-December. It is to be played in a reduced timeframe of around 28 days, with the final being held on 18 December 2022, which is also Qatar National Day.Accusations of corruption have been made relating to how Qatar won the right to host the event. A FIFA internal investigation and report cleared Qatar of any wrongdoing, but the chief investigator Michael J. Garcia has since described FIFA's report on his inquiry as "materially incomplete and erroneous". On 27 May 2015, Swiss federal prosecutors opened an investigation into corruption and money laundering related to the awarding of the 2018 and 2022 World Cups. On 6 August 2018, former FIFA president Sepp Blatter claimed that Qatar had used "black ops", suggesting that the bid committee had cheated to win the hosting rights. Qatar has faced strong criticism due to the treatment of foreign workers involved in preparation for the World Cup, with Amnesty International referring to "forced labour" and stating that workers have been suffering human rights abuses, despite worker welfare standards being drafted in 2014. Al-Sadd Sports Club (Arabic: نادي السد الرياضي‎) is a Qatari sports club based in the Al Sadd district of the city of Doha. It is best known for its association football team, which competes in the top level of Qatari football, the Qatar Stars League. Locally, it is known primarily by the nickname "Al Zaeem", which translates to "The Boss". In addition to football, the club has teams for handball, basketball, volleyball, table tennis and athletics. It is the most successful sports club in the country, and holds a national record of 53 official football championships.The origin of Al Sadd's conception began with four Qatari students who excelled in football, but did not wish to join any of the existing football clubs. After consulting with the minister of Youth and Sports, the group, led by Abdulla bin Ahmed bin Mubarak Al Ali and Ali bin Mohammad bin Ali bin Sultan Al Ali, founded the club on 21 October 1969 in Qatar's capital city. In the 1989 season, they became the first Arab club side to triumph in the Asian Club Championship by defeating Al Rasheed of Iraq on an aggregate of away goals. Twenty-two years later, they won the 2011 Asian Champions League and earned a spot in the 2011 FIFA Club World Cup, in which Qatar finished third. The city will also host the 140th Inter-Parliamentary Union Assembly in April 2019. Qatar's economy is one of the richest economies in the world based on GDP per capita, ranking between fifth and seventh on world rankings for 2015 and 2016 data compiled by the World Bank, United Nations, and IMF.Petroleum and natural gas are the cornerstones of Qatar's economy and account for more than 70% of total government revenue, more than 60% of gross domestic product, and roughly 85% of export earnings. Qatar has the world's third largest proven natural gas reserve and is the second-largest exporter of natural gas. Sheikh Hamad bin Khalifa bin Hamad bin Abdullah bin Jassim bin Mohammed Al Thani (Arabic: الشيخ حمد بن خليفة آل ثاني‎; born 1 January 1952) is a member of the ruling Al Thani Qatari royal family. He was the ruling Emir of Qatar from 1995 to 2013. The Qatari government now refers to him as His Highness the Father Emir.Hamad seized power in a bloodless palace coup d'état in 1995. During his 18-year rule, Qatar's natural gas production reached 77 million tonnes, making Qatar the richest country in the world per capita with the average income in the country US$86,440 a year per person. During his reign, several sports and diplomatic events took place in Qatar, including the 2006 Asian Games, 2012 UN Climate Change Conference, Doha Agreement, Fatah–Hamas Doha Agreement, and it was decided that the 2022 FIFA World Cup was to be held in the country. He established the Qatar Investment Authority; by 2013, it had invested over $100 billion around the world, most prominently in The Shard, Barclays Bank, Heathrow Airport, Harrods, Paris Saint-Germain F.C., Volkswagen, Siemens and Royal Dutch Shell.During Hamad's rule, Qatar hosted two US military bases. It also maintained close relations with Iran. He supported and funded rebel movements, particularly in Libya and Syria during the Arab Spring, while maintaining political stability at home. The Sheikh founded news media group Al Jazeera, through which he maintained his influence over the Arab world. He also played a part in negotiations between the US and the Taliban. In June 2013, Hamad, in a brief televised address, announced that he would hand power to his fourth son, Tamim bin Hamad Al Thani. The body of water is historically and internationally known as the "Persian Gulf". Some Arab governments refer to it as the "Arabian Gulf" (Arabic: ٱلْخَلِيْج ٱلْعَرَبِي‎, translit. Al-Khalīj al-ˁArabī) or "The Gulf", but neither term is recognized globally. The name "Gulf of Iran (Persian Gulf)" is used by the International Hydrographic Organization.The Persian Gulf was a battlefield of the 1980–1988 Iran–Iraq War, in which each side attacked the other's oil tankers. It is the namesake of the 1991 Gulf War, the largely air- and land-based conflict that followed Iraq's invasion of Kuwait. The Qatar Stars League (Arabic: دوري نجوم قطر‎), formerly known as the Q-League, is the highest professional league in Qatari football, with the next tier being the Qatargas League. The league's first season was played in 1963, although the first official season occurred in 1972. The league's most recent winner was Al-Duhail SC, and the club who has won the most cumulative championships is Al Sadd SC, with 13. The league currently features 14 clubs, with one club being demoted to make room for one club being promoted. The Qatari league system provides 4 domestic cups that these clubs are able to participate in: the Emir of Qatar Cup, open to all teams in both the first and second divisions, the Qatar Crown Prince Cup a postseason tournament played by the top four first division teams, the Sheikh Jassem Cup, a prelude to the first division regular season, and the Qatari Stars Cup, a round-robin tournament played midseason. The league title has been won by 8 different clubs since its inception. The team has appeared in ten Asian Cup tournaments and won it once in 2019. They play their home games at Khalifa International Stadium and Jassim Bin Hamad Stadium. The latter is considered the home stadium for the team.Qatar will host the 2022 FIFA World Cup and therefore qualify automatically for what will be their first appearance in the finals. This will be the first time the host nation has never previously competed at the World Cup since the second World Cup in 1934 and the first time that an Arab nation will host the competition. Sheikh Tamim bin Hamad Al Thani (Arabic: تميم بن حمد آل ثاني‎; born 3 June 1980) is the current Emir of Qatar. He is the fourth son of the previous Emir, Hamad bin Khalifa Al Thani. Tamim has held a variety of government posts within Qatar and also worked to promote numerous sporting events within the country. As of 2018, Tamim is the youngest reigning monarch among the GCC countries and the youngest current sovereign worldwide. Vodafone Group plc is a British multinational telecommunications conglomerate, with headquarters in London and Newbury, Berkshire. It predominantly operates services in the regions of Asia, Africa, Europe, and Oceania. Among mobile operator groups globally, Vodafone ranked 4th (behind China Mobile, Bharti Airtel and Vodafone Idea) in the number of mobile customers (313 million) as of 2018.Vodafone owns and operates networks in 25 countries, and has partner networks in 47 further countries. Its Vodafone Global Enterprise division provides telecommunications and IT services to corporate clients in 150 countries.Vodafone has a primary listing on the London Stock Exchange and is a constituent of the FTSE 100 Index. It had a market capitalisation of approximately £52.5 billion as of 10 February 2016, the eighth-largest of any company listed on the London Stock Exchange. The company has a secondary listing on NASDAQ.